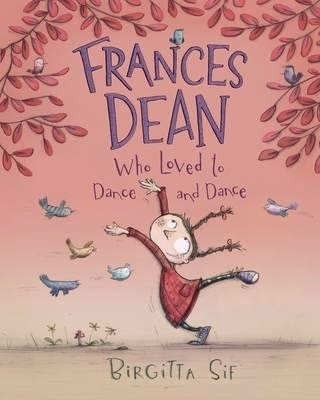 Frances Dean loves to—you guessed it—dance and dance. At school, she dances with her fingers on the desk or taps her feet to the teacher’s voice. And the moment she goes outside, off she goes—pirouetting and prancing to the birdsong on the park. Then people appear. Frances becomes shy, and stops dancing. After a while, she forgets how to dance. Once day, Frances sees a girl singing a beautiful song in the park, openly, without fear. She can’t get the girl out of her mind. She wishes she could feel as confident to dance in front of others. Secretly, with only the bird for audience, she practises her dance moves again—and her confidence grows. She shows her dance to the birds. Then her cat. Then her neighbour’s dog and the old lady she meets in the square. That’s when the little singing girl appears … and she asks Frances to teach her to dance. This is a sweet, simple story about children and their ability to embrace their talents and allow themselves to shine. As the world grows heavy on their shoulders, it’s a sad thing to watch children release their passions for conformity and ‘fitting in’ and not making a fool of themselves, yet the joy and zest to be found in these little characters as they get boogying in the park does little but elicit smiles from adults and the participation of other children, too. What better way to inspire others than to openly live what we love to do? Sif’s uplifting illustrations are a celebration of the lovely little Frances and the people in her village. Both children and adults will pore over every gorgeous detail, from the whirling, spinning Frances and her bird friends, to the full, enchanting park scenes. Joyful.